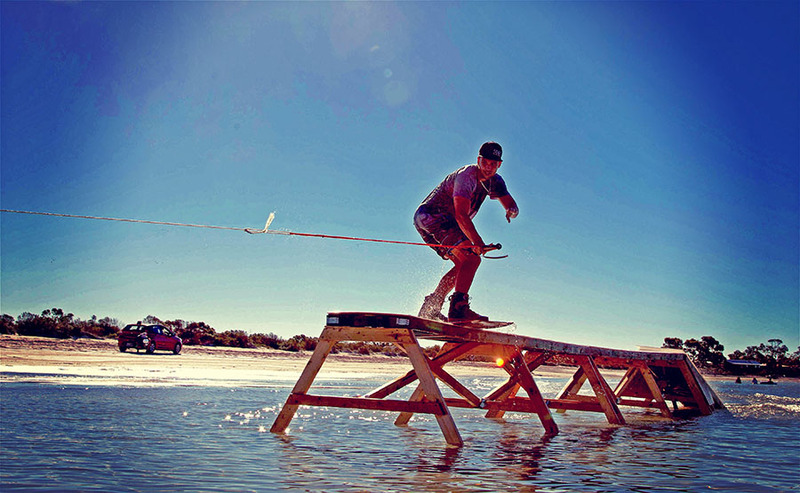 In a small town, sporting a general store with the most expensive fuel you’ve ever seen, somewhere in the deep South of Australia, a bunch of rag-tag kiteboarders from around the country got together for a little shindig. That’s pretty much how it started. 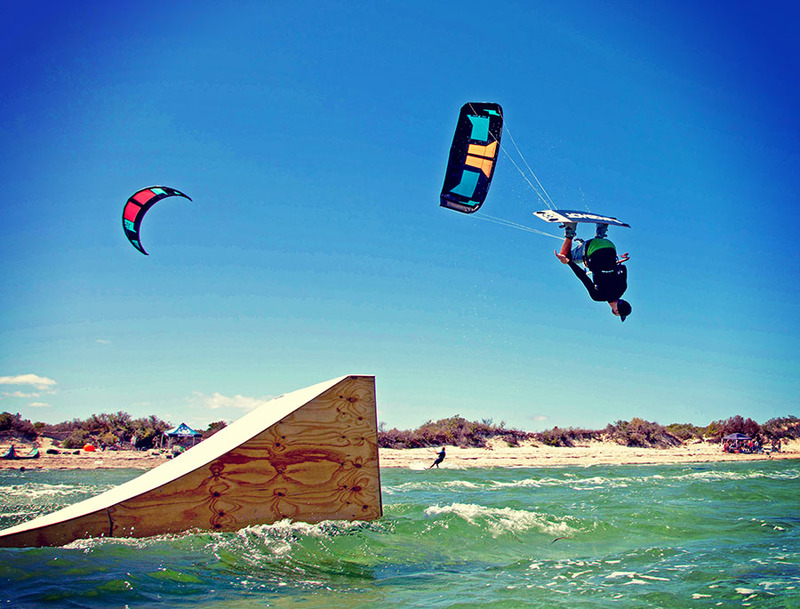 Jordan Roberts, from FSR Industries, a little kite shop in Adelaide, decided one day that if he built some kickers and sliders, and invited a bunch of decent riders from around the country, maybe, just maybe, it would turn into something – and it did. 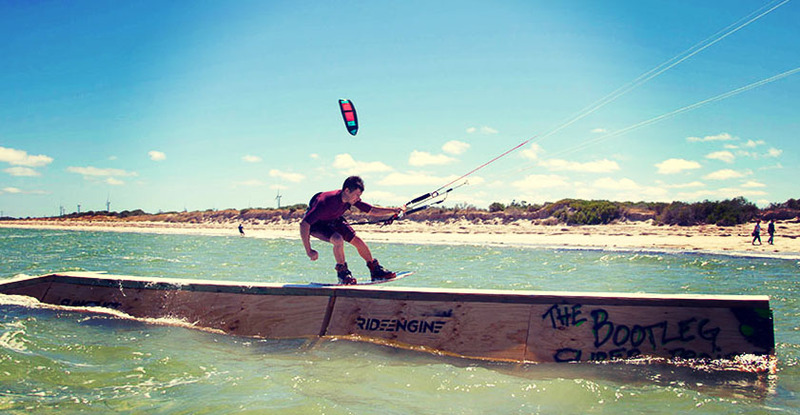 With riders from all over Australia booking ﬂights early based on an idea, including Karolina Winkowska, it became apparent that he’d actually have to get his act together and build the gear. So the slider began to take shape. 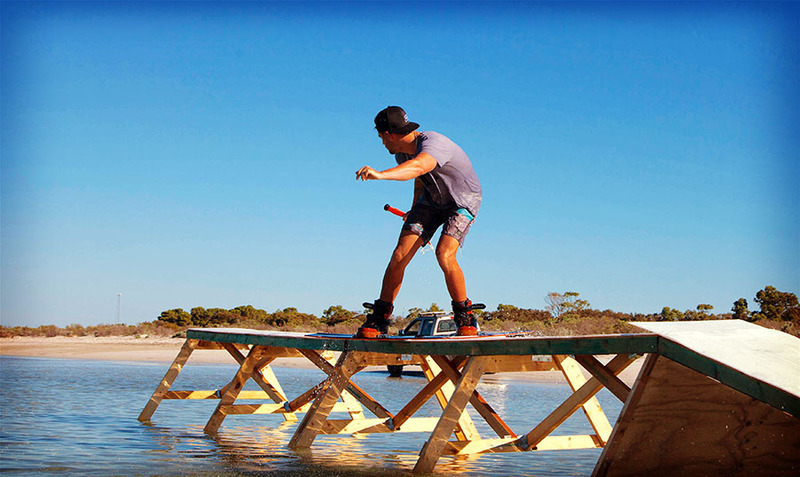 A 12m long beast was created and then Nick Pinfold at The Ramp Champ was charged with putting a kicker together. On the Wednesday evening crew started rolling into town. Local Adelaide rider, Ben Winding and Jordan loaded up the trailer with the slider, strapped the kicker to the roof of the car, and hit the road at a blistering 70km/hr, with the heaters on to stop the car from overheating. A good start. Thankfully “Slingshot Josh” had ﬁlled his van with riders, beers and kite gear, and was hot on their heels, until everyone decided a Maccas run was in order, forcing them to take epic detours into the Northern Suburbs of Adelaide. They were lucky to make it out alive. Eventually we all rolled into the sleepy beachside town of Corny Point, just in time for a few beers to help sleep. Thursday morning rolled around, Australia Day. The decision was made to move the features to another spot about 45 minutes away, so everyone packed up and we hit the road for Sultana Point, a spot known for it’s great ﬂat water. Everyone chipped in, got the features in the water, but the breeze was so light that it was big-kites-only. Still, it was on! As the day went on, the wind built, but sadly, so did the tide, and therefore the chop, just about destroying the slider and kicker. But everyone was still frothing! By this stage, a bunch more crew had joined the fun after ﬂying in Thursday morning. The beers were ﬂowing, the crashes were starting to take their toll, but the smiles were ear to ear. It was a little hard to leave such a wicked spot, but thankfully we ponied up and got back to Corny Point with 4 minutes to spare, just in time to order 20 meals at the local pub – it’s fair to say, we may not have been their most popular patrons that night. But they served us with a smile and the meals were epic. Just ask Matty Curren, who was seen going back for some 3 meals. Growing boy. Friday rolled around, sadly with zero wind forecast. But that wasn’t going to stop us from making the most of the trip. The bunch split for a surf at nearby Dustbowls, then in the afternoon the decision was made to throw the slider in the shallows out front where we’d originally planned to have it, and just tow everyone in with Jordan’s ute. What could possibly go wrong. As it turns out, aside from a couple little dusters, really nothing! The rest of the afternoon was spent pulling people into the slider for some of the best action we’d seen on the trip so far! Meanwhile, Geoff Gent, the master of brisket, had been smokin’ up a feast back at the house. A 12hour slow-cooked slab of cow that literally sent kiters into a frenzy upon their return. Friday night was shaping up to get a little messy. By shaping up, I mean, it actually did. Hanging around the house with Eskys full, tunes pumping and everyone high on an epic day of surf and slider mayhem, it was the wee hours of the morning before everyone hit the hay – for there was wind forecast for Saturday! Albeit, not a whole lot of wind. But after another surf session at another break, Salmon Hole, where Rhys Gardner (SA) and Jake Brenkley (WA) showed everyone how it was done, everyone ponied up for a kite at nearby Berry Bay in the waves. There were some solid sets rolling in, which made for a challenging wave session on 14-17m kites. But everyone pushed hard for the cameras and the locals, and put on a good show. Jordan was even seen having a little cuddle with some overly-friendly rocks at the North end after failing a take off on a solid set. Once the wind began to give out, guys were jumping off the cliffs with their kites, trying to make the water’s edge. In the end, it was time to hit the pub again for another great feed, a little earlier this time though. After three days of antics, the pace was slowing a little, but a few ponied up for another good night. Sunday saw another little surf mission, but a bad call and a lack of time saw them sitting out the back of Berry Bay on the Bommy, waiting for the odd set to roll through. A good excuse to get wet, and cool down before a 40’C drive home in classic South Aussie heat. The Bootleg Slider Project was a success. A test run this year, for something bigger next year! To catch all the social media updates, search for #thebootlegsliderproject and enjoy the banter. A huge shoutout has to go to Slingshot Australia, North Kiteboarding Australia, Ride Engine, ION, Pinnacle Aerial Photography and Videography, True Grip Photography, Daniel Wales Media Production Services and of course FSR Industries for making this whole thing possible. And ﬁnally, without the riders taking a punt on a new idea, and getting on a plane to come along, it would have never been what it was – so thank you! Until next year, bigger and better!